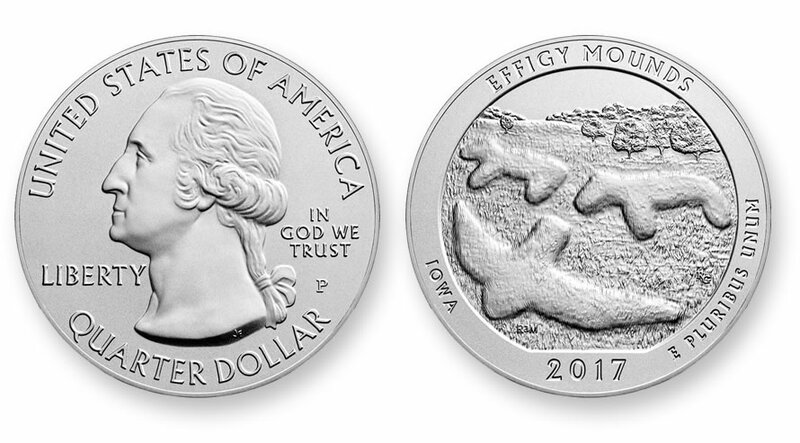 Effigy Mounds National Monument of Iowa is celebrated on a five-ounce silver coin debuting this Tuesday, March 7, from the United States Mint. The collector coin is the first 2017-dated release from the Mint’s series of America the Beautiful 5 Ounce Silver Uncirculated Coins and the thirty-sixth overall. Coins of the program are struck at the Philadelphia Mint, bearing a ‘P’ mint mark, from five ounces of .999 fine silver to a diameter of 3.00 inches. Effigy Mounds National Monument was established in 1949 to protect and preserve more than 200 prehistoric mounds built by Native Americans. The makers, dubbed "Effigy Moundbuilders," constructed mounds in shapes of animals like birds, bears, deer, bison, lynx, turtles, and panthers. Obverses of every America the Beautiful coin share John Flanagan’s portrait of George Washington. Surrounding the effigy are inscriptions reading UNITED STATES OF AMERICA, LIBERTY, IN GOD WE TRUST and QUARTER DOLLAR. Quarters have reeded edges. Edges of 5-ounce silver coins, however, are smooth and with lettering of “.999 FINE SILVER 5.0 OUNCE" to denote its composition and weight. Released at noon ET on the 7th and priced at $149.95, the 2017-P Effigy Mounds National Monument Five Ounce Silver Uncirculated Coin is available from this U.S. Mint product page. The maximum mintage for the silver coin is set at 25,000. A similar 5-ounce bullion silver coin has been available since February 6. It shares the same designs as the collector uncirculated version but lacks a mintmark and has a brilliant finish. U.S. Mint sales of the Effigy Mounds bullion coin total 19,500 pieces through March 3. Intended for investors, the U.S. Mint does not sell bullion coins directly to the public. Instead, they sell through a network of authorized purchasers for a small premium above their melt values. The coins are currently available for about $20 over their silver value, with discounts available when buying higher quantities. The last four coins will debut in intervals throughout the year.